Provided you have the Dot Net framework, Benkyou Studio can be run in portable mode without installation. How Does Benkyou Studio assist study? Benkyou Studio is free, Open source software, so you can get it for nothing! I am a strong believer in open source, and wanted to provide a tool that could help others enjoy learning a foreign language. The Text to Speech functions require you to have suitable Windows Speech languages installed. Benkyou Studio is available here, its is fully functional with no restrictions - this is not trialware. Want to help with Benkyou Studio? If you are willing to help me support your language, please contact me! 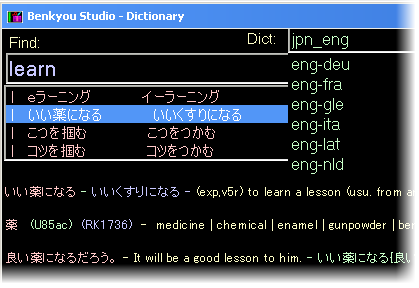 Benkyou Studio uses its own Dictionary format, I can convert other dictionaries to this format to allow the dictionary to support your language, if you know a good free (open source) dictionary which I can convert, please contact me... Please be aware, "No cost" is not enough, it must be allow Free modification and redistribution. I am not currently looking for programming help, I have my own vision for where this program will go from here, and am confident I can take it there, however, if you have other ideas for this project please remember, it is 100% free open source, you can take it, modify it, and distribute it yourself! all I ask is you make your version free, open source, and credit my original in the documentation. Remember, Benkyou Studio's goal is to teach and empower others, so your derivative should be free and Open Source if you want to build on Benkyou Studio! Benkyou Studio is licensed on the Creative Commons "Attribution-NonCommercial CC BY-NC" license. "Non-Commercial" means you cannot sell copies of software based on Benkyou Studio. You are welcome to use it (or derivatives) at work, give them to your students etc. Benkyou Studio uses icons provided by icons8, the license of these Icons is detailed in the software readme. 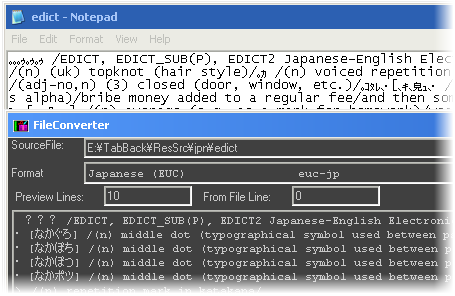 For that answer, Lets go straight to the built in Japanese dictionary! The title "Benkyou Studio" is intended to represent the programs goal of providing a professional solution encouraging study and achievement... And as "Benkyou Studio" is a combination of Japanese and English, the domain name was not yet registered!!! Dictionary:One dictionary with multiple languages, Search for a word and you'll see the meaning of its symbols, and usage examples. Want to learn it? Click Add to studylist! Get the answer wrong? you'll be asked the word more often. Get it right? it'll be a little harder next time!